In an effort to create a relaxing and inspiring pre-production process, Row Apparel offers free graphic art creation*, unlimited revisions, and quick turnarounds... doesn’t get much better then that. All we need is a concept; the more detail the better. We welcome all types of art format submissions. Whether it be print ready art or back of the napkin sketches, send it our way and we will do what it takes to get it looking the way you want. And we will do it all for FREE*! The following are important notes to consider when submitting art. 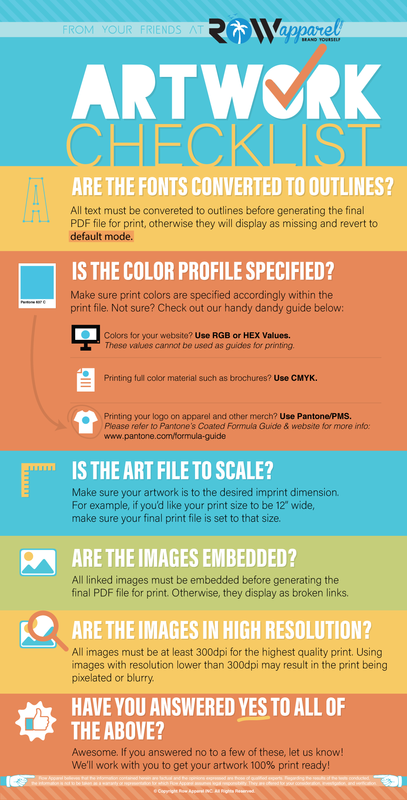 Print Ready Art Submission: the preferred print ready format is vector. Vector art can be created in programs like Adobe Illustrator or Coral DRAW and will typically bear the extension “.ai”, “.cdr”, “.eps”, or “.svg”. Vector images are easy to alter and won’t pixalate when enlarged. Raster images (aka bitmap images) with a resolution of 300+ dpi (dots per inch aka ppi or pixels per inch) work great as long as they are sized at or above the intended print dimensions. True print ready art has been tailored to a project's print mediums and substrates. There are a variety of print mediums (ie: Screen Printing: plastisol, water based inks etc.) and printing substrates (ie: paper, cotton, polyester, etc), all of which need to be accounted for when preparing a graphic for printing. Even if the same file was used with another printer and/ or on another product, a Row Apparel graphic artist will always review the art to ensure that it conforms to the intended print mediums and substrates’ constraints. They will also double check the art for flaws that could be amplified when viewed in a larger size and in a non-digital format. If alterations are needed, we will get your approval prior to production. Concept Submission: Concepts come in many formats including pictures, text descriptions, fonts, sketches, etc. Send us what you have and our artists will convert it into print ready art and collaborate with you until it is just right. * Free Art Disclaimer: The art that Row Apparel creates or alters is done for free as long as Row Apparel maintains the exclusive ownership rights of the art and provided concepts. Unless agreed upon prior to commencing work, all concepts supplied to Row Apparel and anything created or altered by Row Apparel or its affiliated graphic art companies are owned exclusively by Row Apparel. Graphics can be altered, used in marketing collateral, and offered to other customers at Row Apparel’s sole discretion. Should you want to maintain the rights to art created by Row Apparel, please let us know at the onset of a project. A small fee may apply. Additionally, a small fee may apply should you want a copy of your graphic art’s source file.